double layer window curtain set 2 panels included with lining. brushed microfiber 100% polyester super soft material with embroidery. Easy machine wash in cold water gentle. 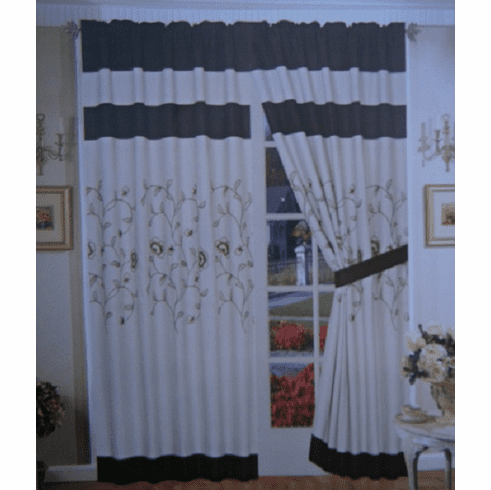 This beautiful windows curtain set include two panels, each panel has size of 60" Wide and 84" Long. Total 120" Wide. Color may vary from monitor to monitor. Two attached the sheer lining. 60x84"
Notes: Each panel has back linen sewn behind and valance sewn on top. So only one curtain rod needed to setup the curtain. Recommend: One set of curtains will fit a window less than 70" wide or fit two small windows that are less than 40" wide each.